Kathmandu airport was as I expected. A tiny building trying to be an airport terminal, with dimly lit immigration counters, three or four luggage carousels, a foreign exchange counter and a hotel reservation counter. 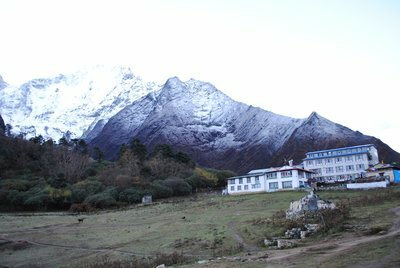 It was raining when we landed and the representative from Ace the Himalaya, Prakash, was already waiting when I reached the arrivals hall. I was swiftly shown to the waiting transportation but was told that I had to wait for another trekker whose flight would land momentarily. One hour later (to be fair to Prakash, he tried to organize alternate transport for me but failed), we were on our way to the hotel which is located in Thamel - a thriving, buzzing, backpacker saturated area of Kathmandu, with streets and streets lined with shops selling everything from trekking gear to food. People walk up and down these streets and it is evident that everyone finds everything around them overwhelming, intriguing and exciting all at the same time. 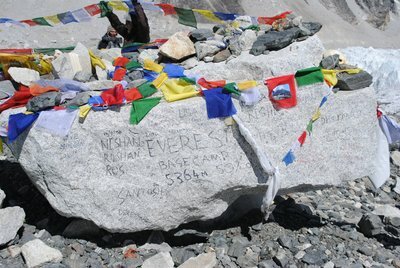 For me, it seemed to be the perfect prelude to what was to come the next day - the Everest Base Camp tour! The hotel, Vaishali, is comfortable, clean, basic. After settling in, I roamed around outside the hotel and came across a charming second hand book store, that sells everything from Sidney Sheldon to RK Narayan. Each book is neatly wrapped in a plastic covering, waiting to be read by the next trekker. Made a mental note to return. 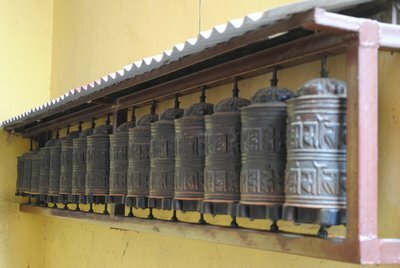 We spent the next day sightseeing -- I think we've seen most (if not all) the temples in Kathmandu. Pashupatinath, Boudhanath, Durbar Square and Bhaktapur. All well worth a visit. 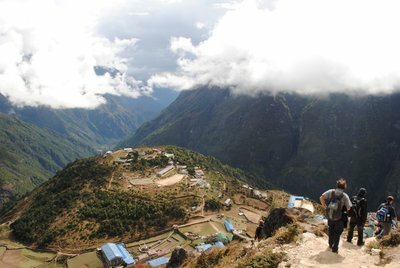 The following day we made our way to Kathmandu airport to take a flight to Lukla, the starting point of several Himalayan trekking tours. Our group thought it would be a case of going to the airport, checking in, getting boarding passes and getting on the flight. Boy, were we wrong! The scene at 6.45 am at Kathmandu airport had to be seen to be believed. Bags everywhere, people yelling, porters and guides franctically going from one desk to the next, potential passengers crushing one another to gain entry into the main departure hall. Chaos. Chaos. Chaos. 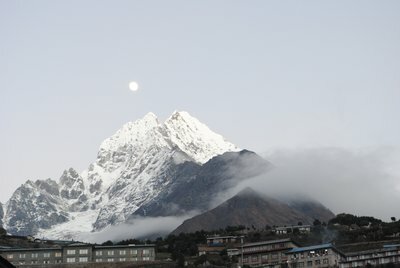 We were told that this was a result of no flights between Kathmandu and Lukla for three consecutive days. We weren't convinced though that this wasn't the scene everyday. Whether we would be lucky enough to get on a flight was a question yet to be answered. We distracted ourselves with the whatever was going on around us while our guide, Raj, tried to obtain boarding passes for us. His red jacket helped us in keeping track of where he was. Eventually, we were off! 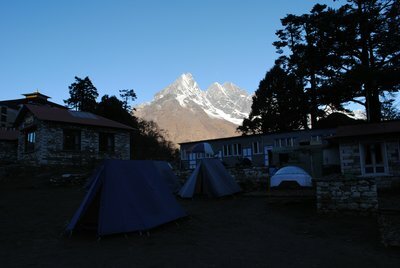 A mere 45 minutes later we arrived in Lukla and started our trek to EBC, a 75 mile journey that would take us 11 long trekking days. I do not intend to go into detail of what we did and where we went on each of those trekking days since there are enough pages on the net that can give you this information -- suffice is to say that no one can prepare you for the experience of this trek and no one can make you understand or appreciate the natural beauty that you encounter during the 11 days. You have to experience it to believe/understand it. 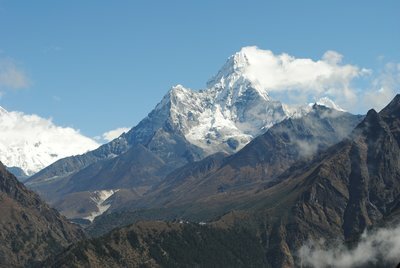 If you are thinking of doing the trek, go for it! You will not regret it. 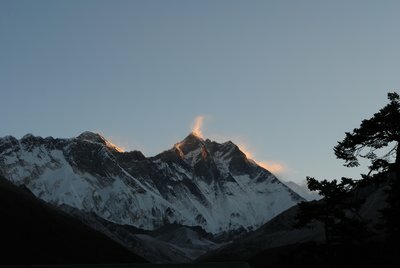 I highly recommend Raj and the Ace the Himalaya team as your guides for this incredible journey. 1. Happiness lies in the smallest of the smallest things: a hot shower..a warm cup of coffee...gloves that keep your hands from freezing! 3. The mind is our strongest ally and our worst enemy. It can make you do anything. 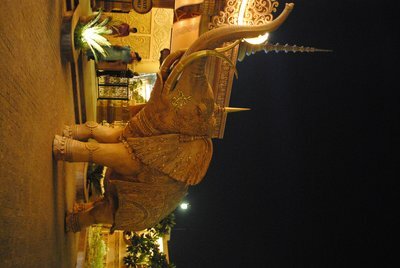 At the risk of sounding like a bad storyteller, Kingdom of Dreams is magical place..a place that has been created to showcase works of a particular type of art, i.e. 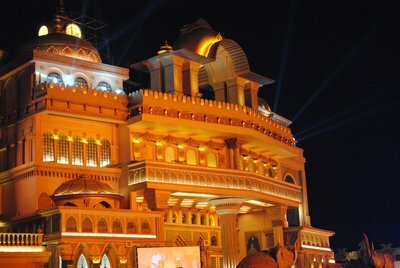 art relating to or emanating from Bollywood -- from the gawdy colours and designs on the facade of each structure to the musical, Zangoora, which is being showcased in Nautanki Mahal (part of the Kingdom), everything screams Bollywood. Zangoora is a story of a prince, raised as a gypsy, who eventually returns to rule his kingdom. 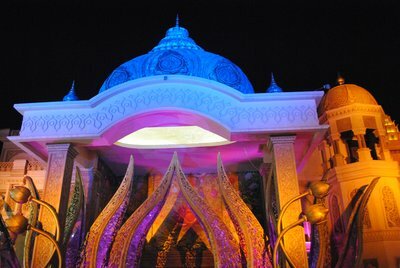 The story is told using extraordinary sets, lighting and foot-tapping, energetic Bollywood numbers. My companions and I thoroughly enjoyed the show -- there were two acts with an intermission in between, during which we nibbled on some Chicken Boti and Amritsari Fish at the bar, and washed them down with Kingfisher beer and Sula Sauvignon Blanc. 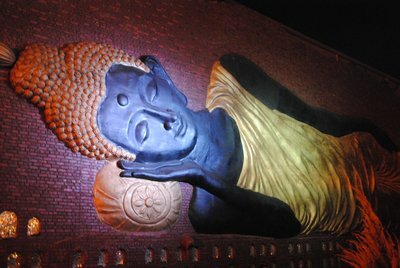 The show is highly recommended -- whether you are a visitor or a resident. 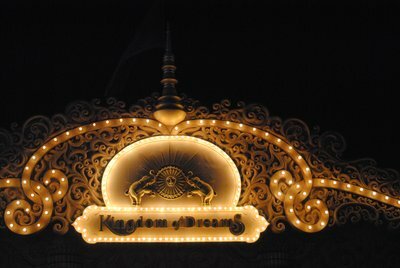 Tickets can be booked online on the Kingdom site. At the end of the show, the dancers in the show pulled us to the floor to join them and we did...after all, it's not everyday that you're given the opportunity to act like an "extra" on the set of a Bollywood film! P and I were aimlessly roaming in Mega Mall, Gurgaon when we noticed the rather inconspicuous Commonwealth Games ticket stand in the corner of the main foyer. It was manned by two guys in plain clothes -- one was selling tickets, the other souvenirs. The ticket guy had a laptop and portable printer in front of him. We decided then and there that if there were tickets to be had, we were going to have them. We stood in the queue - which basically consisted of us and one other person who was already engrossed in a heated argument with the ticket official. The argument related to tickets that had already been purchased, which the buyer was now trying to return to the ticket official. The buyer was trying everything - sob stories, pleas, threats. Unfortunately for him, the ticket official was having none of it. We waited..and waited some more. We picked up the tattered Games schedule that was on the ticket official's "desk" and decided the day on which we wished to attend. Eventually, the buyer gave up and left. Yipee. Us: "Bhaiya, do ticket kal shaam ki track and field ke liye hain?" (Translation: Brother (although he is not a relation of ours), do you have two tickets for the track and field event tomorrow evening?"). Ticket Official: "Haan. Paanch Sau ya Hazaar vali?" (Translation: Yes. 500 or 1000 rupees each?). We had to wait yet again for the ticket official's chum to come with "ticket paper" that the official could load into his portable printer to print our tickets. Finally, we got them and proceeded to celebrate by having chaat at Haldiram's. We left home at around 4 pm the next day. The doors for the event which we were to attend were scheduled to open at 5.30 pm and the event was being held at the Jawarharlal Nehru Stadium. The driver dropped us off at a traffic signal from where we made our way, through a foot bridge, to the stadium entrance. The area around the stadium had been cordoned off and security measures seemed more than adequate, judging by the number of cops and commandos around us. However, it was somewhat disconcerting to see cops who looked like they had just exited their teens holding AK-47s. People from all walks of life were around -- some were waiting in the ticket queue, others were waiting for their friends to join them and some, like us, were heading to gate 9 to enter the stadium. There was a feeling of anticipation and excitement in the air. P and I clutched each of our tickets and joined the "ladies only" queue to enter gate 9. This queue was further split into a "have handbag" and "don't have handbag" queue. P joined the former, I the latter. The handbag ladies had to put their belongings through an x-ray machine while the rest of us simply passed through the metal detector. We finally made it in and then walked for about 1 km before reaching the elusive gate 9. We stopped on the way to get some Maaza mango juice but since the drinks stall was out of it, we reluctantly settled for Cokes instead. Once inside the arena, we both noted, with delight, that the atmosphere was electric. It truly was. The crowd cheered the athletes with gusto.. and with double gusto if the athletes happened to be Indian. Giant screens had been put up to display the various scores and those emotion-filled moments before/after an athlete had completed their part in an event. P and I were particularly amused by an Indian triple jumper who seemed to have a routine (undoubtedly a superstition of some sort) that he performed before each jump: first he used his index and middle fingers of both hands to rub his temples, then he pressed his palms down in front of him (in a motion that looked like he was trying to calm someone else) and finally he raised his arms up and down in a gesture that urged the crowd to make some noise. The crowd obviously obliged. After each jump he jumped up and down, as though he had won the gold, and ended his solo act with a massive air punch. He came 4th in his event. We watched the women's pole vault event, the men's javelin throw, the men's triple jump, relay races and several medal ceremonies. Being at the Games to witness these amazing sportspersons made one forget about all the controversies surrounding the Games. We ended the evening after watching the Indian women's team take the gold in the 4x400m relay race. A spectacular display of speed and teamwork. P and I were proud of what India had achieved at the Games - as hosts and as participants. Once upon a time there was an airport known as the Indira Gandhi International Airport. The airport welcomed flights from all over the world. It was massive in size -- however, it eventually became dilapidated as a result of wear and tear and a lack of general maintenance by those in-charge. Soon visitors started dreading having to visit the airport and once they were in it, hurried to escape. As I step off the plane and onto the aerobridge, my eyes and nose get ready for the sights and smells that, I anticipate, will greet me -- the sight of pot-bellied police officers, in decade-old mud-brown uniforms, wearing a look of genuine boredom, lazily gazing at passengers making their way to the immigration counter, while forgetting their duty to secure the safety of those around them -- and the combined smell of a dirty old carpet, smoke, sweat and mango pickle. I'd also usually expect to see a couple of airport workers in white uniforms bearing badges with generic "A Sharma"-type names printed on them, guarding rickety wheelchairs, waiting by the door of the aircraft and a solitary greeter with the name of a "VIP" scribbled in white on a board standing next to them. I quickly realise that that was then. Today, now, this time..was different. This time I immediately notice that we are in a new terminal (the T3!) with a brand spanking new carpet (not my choice of pattern but let's not get caught in the nitty-gritty). I then notice that the terminal is comparable and generally at par with the airports in cities such as Dubai and Singapore, with all the conveniences that one would expect in those places. The signage is clear, correct and brightly illuminated. Everything, from the airport personnel to the baggage trolleys, is in its place. There is an air of efficiency around me, neatly enhanced by a lime-lemon air-freshener. The lines at the immigration counter are moving a rapid pace and the immigration officers are smartly turned out. Most even have a smile on their face and are making a real effort to talk to the passengers. Did I hear one of them say "Ma'am"? I give the South African team who were travelling in the same flight a look to say "See! We can do international standards too!" and then proceed toward baggage claim. I see the team being directed to a different part of the airport by a smart, 5 foot 6 inch female CWG volunteer, clad in a red and white tracksuit and carrying a clipboard. They follow her without question, looking like lost toddlers in a public park. It takes less than a minute for me to clear immigration and our bags are already on the assigned carousel when I reach. As mine steadily makes its way to me, I notice posters depicting various things that Indians are undoubtedly proud of (such as Mahatma Gandhi) all around me -- an attempt to add an artistic touch to the place. 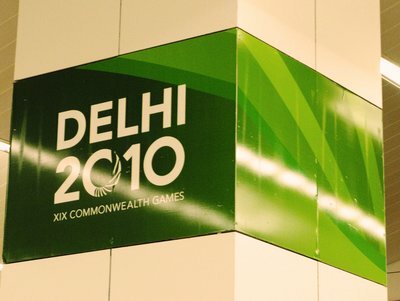 "Delhi 2010 XIX Commonwealth Games" proclaims each pillar. I feel a sudden and unexpected sense of pride and reach for my camera.